선입견과 트라우마가 어린 탈북자들을 힘들게 한다. Social stigma, trauma haunt young escapees of North Korea. 탈북한 아이는 그가 13살이라고 했지만 8살 정도뿐이 안되어 보였고 6살 정도의 글씨체를 갖고 있었다. The refugee from North Korea said he was 13 years old, but looked nearer 8 and had the penmanship of a 6-year-old. “북한에서 학교에 다니지 않았어요. 다니는 아이들이 별로 없었어요.”라고 이 남자아이는 코리아 헤럴드에 말해주었다. 아버지는 북한에서 돌아가셨고 누나는 실종되었다고 했다. “I didn’t go to school in North Korea. Few children back there did,” the boy told The Korea Herald, anonymously. His father passed away in an unspecified event back in the communist country and his older sister is missing. 한국에 오는 것이 그를 위해 새로운 기회들을 열어주었으나 그는 여전히 새로운 문화와 환경 그리고 새로운 삶에 적응하는데 어려움을 느끼고 있다고 했다. The escape to the South opened up new opportunities for him, but he says he still has trouble adapting to the new culture, new environment and new life. 아이는 또래보다 30센티 정도 작았고 말수가 적었다. 하지만 그의 꼭 다문 입과 겁에 질린 눈은 무엇인가 할 얘기가 있어 보였다. 탈북 아이들은 선입견, 교육 부족 그리고 새로운 문화를 받아들여야 하는 엄청난 과제 때문에 한국에서의 새로운 삶에 적응하는데 어려움을 겪는다. The boy, standing nearly a foot shorter than his classmates, did not talk much, but his clamped mouth and eyes full of fear told a story of their own. Young defectors from North Korea often have trouble adapting to their new environment in the South due to prejudice against defectors, a lack of studying and the herculean task of taking in a completely different culture. 탈북아이들을 위한 두리하나 국제학교를 이끄는 천기원 목사는 북한의 처참한 현실과 그 나라로부터의 탈출과정은 아이들에게 큰 충격으로 남는다고 한다. 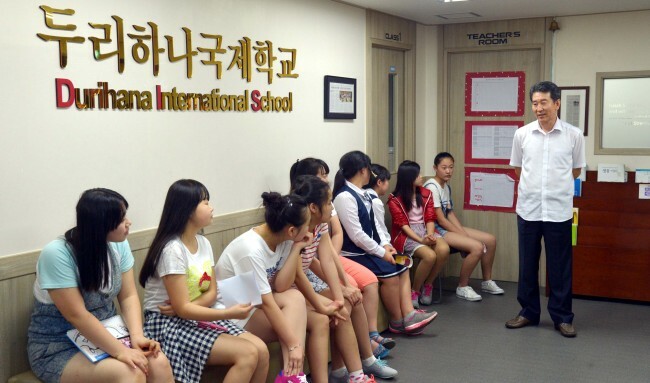 Pastor Chun Ki-won, who heads the Durihana International School for defector children, said the brutal reality of the North and the escape from the country tend to leave children traumatized. “The biggest problem is that (defectors’) family are dissolved the moment they cross the border. Sometimes mothers are ‘sold’ to men in China in a form of unwanted marriage,” the pastor said. 무너진 가정, 잡힐 것에 대한 두려움 그리고 북한에서의 굶주림과 고통은 이 어린 영혼들을 괴롭힌다. 13살짜리 여자아이는 한국의 학교에서 친구들과 수업내용을 따라잡을 수가 없어서 두리하나로 올 수밖에 없었다고 했다. Broken families, fear of being caught and the memories of hunger and pain back in the hermit kingdom are what ails the young minds. A 13-year-old girl said she had to move to Durihana because she could not keep up with her classmates. 학원에 가고 과외를 받기는커녕 탈북 아이들은 배울 수 있는 기회가 정말 적다. 이 아이들은 더 많은 시간과 노력을 들여 모자란 교육을 받아야 하지만 많은 탈북자들은 공부하는 것이 왜 중요한지 이해하지 못한다. Far from going to private institutes and receiving help from tutors, defector children have only minimal opportunities to learn. Although these children need to spend more time and effort to make up for the lack of education, many defectors fail to see the importance of studying. 천목사는 이것이 세상에서 가장 억압적인 환경에서 자랐기 때문이라고 한다. 북한에 살던 사람은 살기 위해서 무엇이든 하는 본능을 키우게 된다고 한다. This is largely due to living in one of the most repressive environments in the world, according to Chun. He said that former residents from the North have often developed an instinct of doing anything necessary to survive. 아이들 또한 잡힐지 모른다는 공포와 불안에 시달리고 부모가 자기들을 원하지 않는다는 분노와 절망감을 갖게 된다고 한다. 많은 아이들이 불안감을 보였고 떨어진 가족들에 대해 자세히 언급하기를 꺼려했다. The children too fell prey to the fear and anxiety of being caught, resentment and despair of not being wanted by their parents. Many showed signs of anxiety and refrained from going into details about their separated families. 정신적 외상을 입은 아이들의 마음에 영향을 끼치는 것은 어려운 일이었다. 그래서 천목사는 음악의 도움을 받게 되었다. 화합의 가치를 가르치기 위해 학교 합창단을 구성했다. Accessing the traumatized children’s hearts is a tall order, and Chun turned to music for help. In order to teach the children the values of cooperation, the school formed a choir. 처음에는 아이들이 화음으로 노래하는 것을 이해하지 못했다. 자기가 노래할 수 있는 가장 큰 소리로 노래했다. “각자 자신만 챙기는 것”이 아는 것의 전부였기 때문이다. At first, the children did not understand the concept of singing in harmony. They would all sing as loud as they could, because “every person for themselves” was the only way of life they knew. 하지만 본인들의 노래 소리를 듣고는 얼마나 끔찍했는지 깨닫게 되었다. But upon hearing their singing, they realized how horrible it was. 천목사는 “우리의 목적은 삶이 “나”에 관한 것이 전부가 아니라 다른 사람과 더불어 사는 것임을 알려주는 것입니다,”라고 한다. “Our goal was to let them realize that it’s not just about ‘me,’ but people have to live alongside others,” Chun said. 한때 은둔자 같던 아이들이 껍질을 깨고 나오기 시작해서 전혀 모르는 사람들 앞에서 공연을 할 정도의 용기를 갖게 되었다. The once-reclusive students gradually started to come out of their shells, even braving to participate in performances in front of complete strangers. “합창단에서 노래하는 것이 좋아요. 같이 하나처럼 되는 것이 좋아요,” 두리하나의 한 남학생이 말했다. 이 학생이 얼마나 공연을 좋아하는지는 목소리에서 느껴지는 흥분과 얼굴의 설레 이는 표정에서 볼 수 있었다. “I like singing in a choir because we get to work together, become like one,” said one of the boys at Durihana. Although crudely put, the boy’s fondness toward performing was hinted in the excitement of his voice and the eager expression on his face. 음악이 아이들의 마음을 움직이기 시작했지만 한국이 이 아이들의 진정한 집이 되는 과정은 이제 시작이다. While music played its part in penetrating the children’s hearts, the process of making South Korea their true home is far from over. 천목사는 “열등감, 혼자 남는 것에 대한 두려움, 다른 사람들이 얕잡아볼 것에 대한 생각들이 이 아이들의 미래를 어둡게 합니다,”라고 말한다. “A sense of inferiority, fear of being alone and the thought that others will look down on them looms over the defector children,” Chun said. 궁극적으로 탈북 아이들과 그들의 교육이 오랜 세월 열망했던 통일을 이루어진 후 두 나라의 차이를 극복하는데 가장 중요할 것이다. 천목사는 목숨을 걸고 그들을 도우며 중국 감옥에 갇혀있기 까지 했지만 탈북자들이 완전히 마음을 여는 것은 불가능하다고 한다. Ultimately, defector children and their education is the key for the Koreas overcoming their differences in seeking long-coveted unification, Chun said. The pastor said it was impossible to get defectors to truly open up, despite risking his life, even serving time in Chinese prison, to rescue them. “No matter how much I try to convince them that I understand what they are feeling, they always end up saying, ‘but you’re from South Korea.’” Chun said.